Damm! A whole carton of cherry tomatoes on the floor! One of those fangdangle bowl-shaped cartons with the snap-on-lid that holds a whole bunch of cherry tomatoes just came unsnapped, flinging its contents all over the kitchen. Three red orbs land in the sink, a bunch hit the counter and the majority are rolling all over the brick floor. Dolce and Amore perk up when they hear me cussing and immediately come running into the kitchen to investigate, muzzles to the ground, checking for spillage. In Amore’s eagerness, she grabs a little red sphere before Dolce can, and quickly bites into it. Just as quickly, she drops it back on the floor, her jaw working furiously to remove the acidic taste from her mouth. There’s not enough water in the toilet bowl for her to rinse out the flavor. Apparently, Amore doesn’t like cherry tomatoes. Now Dolce on the other hand, comprehends real quick that Amore has the lead in eating the lit’l delicacies. She only sees Amore getting the drop on the tomatoes before she can. Dolce immediately turns her focus to a pile of tomatoes nestled in the kitchen corner, swiftly scoops up five tasty morsels into her mouth and promptly heads to her special pillow in the living room with her coveted stash. In her rush to grab the most, she doesn’t see Amore heading to the bathroom to guzzle down some water, she only knows she grabbed more than her sibling. Sensing victory, Dolce chomps down on the juicy lit’l guys, squirting seeds and sticky tomato juice in all directions. Faster than you can say the word “ta-mah-tau” the look of triumph that had entered into her eyes turned to horror as she realized she didn’t like what was in her mouth. Hastily, she spit out the tomatoes. UCK! Chunks of tomato carnage go flying through the air, landing on chairs, couches and pillows. It seems Dolce doesn’t like tomatoes either. A great summer salad and perfect for company! Slice the tomatoes and then slice the mozzarella. On a serving platter, alternate the tomato slices and the mozzarella. Tuck in the basil leaves between the tomato and mozzarella. Cover with plastic wrap and chill. In the blender, mix together the remaining ingredients until well blended. Keep at room temperature. Drizzle over the tomatoes and mozzarella when ready to serve. Monday through Friday, I am the one to feed the girls their morning meal. Early. 5:00 a.m. early. Our dogs are conditioned to enjoy their breakfast at the crack of dawn, when it’s still dark and cold out. Once their bellies’ are full, they settle back down on their huge dog pillows for a little morning shut-eye as I sip my coffee and read the paper before I leave for work. Come the weekend, my wonderful, sweet hubby gets up early to feed Amore and Dolce, allowing me to sleep a couple more hours before I start the day. For some perverse reason, on the weekends, the girls start scrambling for their breakfast around 4:00 a.m. They’ll come around to the side of the bed, checking to see if one of us is up yet, being sure to whack their tail several times for good measure. On a good day, they might wait until 4:30 a.m. before starting their wake-up antics. If need be, Amore will jump up on the bed and sit on one of us in her attempt to get fed. It’s about this time, I’m kicking Malc in the back, “it’s your turn to feed’em!” I mumble. Blurry eyed, and three-quarters still asleep, he stumbles out to the dark kitchen, tripping over 200 excited pounds of two hungry dogs in their mad bid for their kibbles. From the other room, I hear several choice words spewing loudly from his lips as his bare feet and legs are clawed by dog paws in their eagerness to be fed. I hear the clank and clatter from their metal dog bowls being pushed around the hard floor as they devour their food. Then quiet. Blissful quiet. Wonderful-fall-back-to-sleep quiet. While the girls are still chowing down their food, Malc will crawl back into the still warm bed, staking out his territory on the mattress. He has about 2 minutes to fluff his pillows and get comfortable before the girls search us out, climbing up on the bed to snuggle in for a few more hours. A half hour later, Gordita joins the family snugglefest, stepping over fur and bodies to curl up on a down pillow. By the time, I’m ready to rise, I have two dogs stretched out on each side of me and a cat up on my pillow loudly purring in my ear, a black cat tail draped across my face. I can’t move. I look over at Malcolm and see a slight smile peaking through the covers. “Psst! You awake?”, I persist in waking him. One visible eye opens, we share a contented, loving look as we view our menagerie nestled on the bed. Our family. It brings a warm hug to our hearts. Sunday morning is our special day of the week to laze around, read the paper, drink our coffee, share breakfast. It’s turned into tradition, having our girls curled up around us as we read the comics, the OpEd page, the local news, sipping hot coffee, being careful not to spill any on the covers. Breakfast turns into brunch, but who cares, it’s our lazy day to enjoy our family. Perfect for those lazy Sunday mornings, these cakes are light and fluffy – the secret is taking the time to beat the egg whites separately. In a medium bowl, sift together flour, baking powder and salt, set aside. In a small bowl, whisk together milk, egg yolk and zest. Set aside. Beat egg whites with an electric mixer until stiff peaks forms. Stir milk mixture little by little into the flour mixture. Carefully fold in egg whites and then add the sliced bananas. Spray non-stick cooking spray on a large non-stick skillet or griddle and warm over medium heat. Ladle batter onto hot griddle using a 1/4 cup measuring cup to pour batter, making a hotcake. Repeat until griddle is full. Cook until bottom is set and golden brown, about two minutes. Flip and cook until firm, another 2 to 3 minutes. Set aside and cover to keep warm until you’ve cooked all the hotcakes. Serve hotcakes topped with warm raspberry jam and vanilla yogurt and raspberries. ahhh, we didn’t eat that much! With the of loud swoosh of the refrigerator door opening, Amore and Dolce are immediately on the alert to kitchen activity. The clink of condiment jars rattling against each other as the door swings open, informs them of a possible treat or nibble of something good. The crinkling of plastic is blatant advertising of cheese or maybe carrots. The un-snapping of a plastic lid translates to yogurt or sour cream. From the living room, the girls can decipher if the clanking noise is Malcolm reaching in to grab his Ice Tea pitcher or if the crackling sound is some cheddar cheese being placed on the kitchen counter for slicing or grating. They can verify the difference between the opening of the frig door and the freezer, between the lifting of the treat jar lid and the spare change cover, between the squeak of the cupboard and the drawer. Their ears can define a broccoli chop vs. an onion cut, a carrot slice vs. celery stick. The sound of the knife against the chopping block as it cuts through the veggie announces how quickly the girls will start sniffing around the kitchen. They love broccoli and carrots, can’t have onions, and are so-so with celery. Amore immediately runs in to investigate. Nose to the floor, sniffing out the latest crumb, Amore is determined to gobble it up before Dolce has a chance to. Dolce, on the other hand, waits on the couch, head tilted, eyebrows cocked, her little mind working to interpret the sound coming from the kitchen. Dolce is more discerning. She wants to know the clatter is worth the effort of movement. An apple wedge, a cheese cube or a carrot stick will haul her off the couch and into the kitchen in three seconds. Or, if she hears Amore chomping, she can be there in two. The jangle of the silverware drawer doesn’t even merit a head lift from her soft pillow. I would have to say cheese is their absolute favorite. Even Bleu Cheese. Preheat oven to 350 F. Butter a 13x9x2 inch casserole dish. Cook macaroni pasta in boiling water per package directions, until just tender but still firm to bite. Drain, rinse and drain again. Cook chopped bacon in a heavy skillet until crisp. Transfer bacon and 1/4 cup bacon drippings to large bowl. Add breadcrumbs, 1/4 cup Asiago cheese, and 1/4 cup parsley with bacon and toss until blended. Add minced garlic and jalapeno to remaining pan drippings in skillet and saute over medium heat until fragrant. Add flour and whisk 3 minutes. Gradually add in whole milk, then add egg yolks, cayenne, dry mustard, salt and pepper. Cook until mixture thickens, whisking constantly. Add 2 cups of the Fontina Cheese, Cheddar cheese, remaining Asiago cheese and stir until cheeses melt. Remove from heat. Mix in macaroni, coarse-grain mustard, remaining parsley and the last of the Fontina Cheese. Transfer macaroni mixture to prepared dish. Sprinkle breadcrumb mixture over macaroni . Bake just until topping is golden about 15-20 minutes. If a little is good, then, a lot is better. Trust me. Always add a little more butter and a lot more cheese! Siblings. At 10 years old, older and younger brothers and sisters are the bane of our existence. The natural pecking order decrees, the older sibs pick on us and the younger ones, by nature of being the littlest, bug us. By the time we’re 25, those same unbearable beasts are our best friends. The years in between are layered with childish fights over who is Granny‘s favorite, who got the bigger slice of apple pie and cries of “am-so-am-not’s”! Years that are peppered with spats over who received better grades, scored higher on a test and was most popular at school. Throughout is the underlying rivalry of ‘besting them’, a thin whisper of competitiveness threaded between siblings to do just as well, if not better. To out-score, out-smart and out-win the beast from our younger years. Though poles apart in personality, talent and smarts, Amore and Dolce do share one thing in common – sibling rivalry. They know if they have been slighted, if one receives an extra indulgence over the other, when the other is benefiting from special attention, and whether or not they have been left behind from a trip in the car. Their competitiveness kicks in as they jockey for position to sit next to me on the couch for their nighttime loving. Dolce especially, as she backs into the pocket between the couch pillows and my side, scooting closer and closer against me as Amore attempts to come around by the back of the sofa to divide, separate and conquer. Jealousy takes over if one of the girls is getting all the petting and belly rubs. Nose nudging the elbow to disrupt the canine massage, they will manuever their furry head to steal some ear-scratching pleasure. If one has a toy, the other one wants it. Not to chew on, just to know that they can take it away. Dibs on the pooch pillow is ignored, losing their favorite spot if they leave their warm perch to go outside. All of a sudden they are mathematicians, counting the exact number of treats, to the last kibble given and to whom, and know if an additional delicious nugget was dropped and caught by the other. On leash, Amore takes the lead, her nose just inches past Dolce’s, but ahead none the least. Going to the store, Dolce is riding shotgun no matter what, at no matter what cost. Amore can out run, out race her sis. Dolce out-smarts and out-wits her litter mate. On occasion, we’ll hear a low growl, the start of a sibling squabble, resulting in a pout from Amore or a yelp from Dolce. Just as quick, its forgotten, the toy ignored. At four years old, Amore and Dolce are best buddies’, side by side. They share their food but not their treats. Amore pulls ahead on walks, Dolce grabs the front seat on trips. Both can do the math. Thump. Thump. Thump-thump-thump. Thump-thump-thumpity-thump. Whack! Whack-whack! Whack! C.R.A.S.H. Knowing the difference between a one thump tail thunk and a whackity-whack wallop can rescue dog owners from future calamity. Here are descriptive clues on what each thump and whack really mean…. The ol’ one thump is clearly an insult, the slightest lift of their head, barely acknowledging something might be happening, perhaps an arch of the brow or a twitch of the ear. The effort to investigate is not worth moving from their dog bed of lethargy. You’ve been ignored. This is good. You can return to your baking. A two or three or four tail-thump is an improvement – they have expanded enough energy to give you several beats of interest before emitting a loooong drawn out sigh. One eye ajar, wavering between going back to snoring or exploring the new development, this tail-thumper is classified as a true put-a-pond sign of disgruntlement. Your dog really doesn’t want to get up to probe but they also don’t want to miss anything. You’re safe. You’ve got a 90% chance dog dreams are more important than rising to sniff out their curiosity. Keep doing what you were doing. Now a thumpity-thump-thump-thump is heading into the danger zone. Tail speed is kicking up, creating 30 mph winds. Eyes alert, standing at attention, you’ve piqued their interest and you’ve got 100 pounds of torque just waiting for the secret, silent signal to move. Let the cookies burn in the oven. MOVE. You need to divert disaster before it attacks you. The odds have swiftly moved up to a solid 69% chance of rapid canine involvement (RCI). Pay attention. Do. Not. Turn. Your. Back. On. Tail. The whackity-whack tail whack will put TSA on red alert. Whacks of this type will inevitably bring a loud, vociferous collision of canine tail and object. Beware. Tail-whacking at this velocity can literally cause annihilation of your home. This whack is a weapon of mass destruction. Decorative couch pillows have known to blow up, millions of little white chicken feathers spreading like wild-fire throughout the house. Coffee cups shattered in one swoop of a frantic tail whack. Papers, mail and file folders flown into the air, scattering like blind mice on the run. Do not call 911. You are on your own here. At this point, you’re totally screwed. If you have any cookies left that aren’t burnt, I’d start eating. Preheat oven to 350 degrees. Cream butter, sugars, egg and vanilla until smooth. Sift dry ingredients together and add to creamed mixture. Add oatmeal, corn flakes, coconut and nuts. Mix until blended. Roll into small balls and place 2 inches apart on a greased baking sheet. Bake for 10-15 minutes. 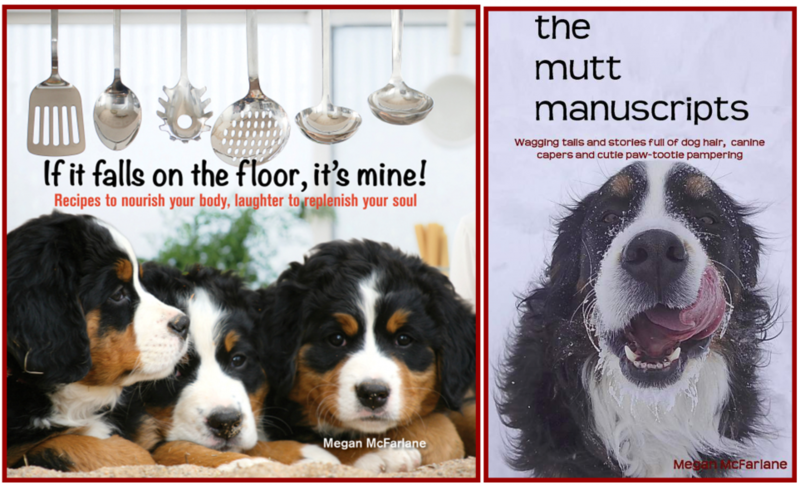 Berners are the type of dog that want to be with you – – – always. Where you goeth, they goeth. If you step outside, they want to be outside with you. If you need to run to the store, they need to go along with you, riding shotgun in the passenger seat. They will be out the door and in the car before you’ve begun to search for your car keys. If you need to use the restroom, they want to follow you. Walk into the kitchen and paws pitter-patter beside you. Two perpetual furry shadows, dogging your step. Shutting the door on their noses only produces sniffing and scratching, amplified by two. On occasion we elect to keep the girls home. In the summer, the temperatures are too hot for them to be left in the car without air conditioning and other times, our errands run longer than we want to keep them cooped up in the SUV. They’ve learned when they may join us for a car ride and when they are staying put, depending on the time of day, the clothes and shoes worn, and if they hear a certain jingle of the car keys. Early mornings they recognize its “me leaving for work” time. They follow me into the bathroom and hang while I am getting ready for work. They walk with me to get the morning paper and follow me around as I pour my “must-have” coffee. By the time I grab my car keys to drive into town for work, they are already sprawled out napping from their busy morning. I scratch their ears good-bye as they lift their heads, watching me walk out the door, back asleep before I’ve pulled out of the garage. They have become skilled at learning the difference between a “slide your foot into a heel” shoe and a “bend over to tie the laces of your hiking boot” shoe. With the heel, they are accepting of their fate. Knowing they will be staying home with Gordita, our cat, they have already gone back to what they were doing. The boot means “WALK”, “RIDE”, or “BOTH”. Any of which creates pandemonium. A jingle of the car keys will bring a concerto of joyous high-pitched barking that continues through the process of loading them into the vehicle. To our dismay, we have discovered there are times when Dolce and Amore have attempted to follow us, ignoring our command to stay. On one such time, I drove home from work to find Dolce and Amore in the front portal, the front door wide open. I just assumed Malcolm had opened the door for fresh air. In reality, Malcolm had walked next door to deliver some misplaced mail. The girls did not like the idea of being left alone at home, listening to the crunch of gravel as Malcolm walked up the driveway. Dolce had pawed the dead bolt, unlocking it, and on the down-swing, her paws hit the handicapped handle, swinging the door wide open. Freedom. Thankfully, the half-walls of the portal are too high for them to escape. Dolce has turned her clever door-opening talent to other doors throughout the house. Back doors, garage doors, closet doors, even shower doors, she opens and shuts doors like a cat-burglar pro. She stands on her hind legs and uses her front paws to turn the lock. She then uses her weight to push in the door, gaining entry into the next room. Should the door shut on her, she repeats the process, and with a descending slide, she hooks her paws on the handle lever and pulls open the door to come back through. We caution our over-night guests to lock their bedroom door or they might have a four-legged visitor during the night. Her special ability has forced us take stronger measures against future door openings. We’ve installed additional hardware, slide locks and hooks, key locks and more dead-bolts, all designed to keep our Houdini dog where she belongs. I am thankful this proficiency isn’t genetic and Amore isn’t that smart! But then, maybe she is – Dolce is the one opening the door for her. Like clockwork, come 5:00 p.m. the pooches are in pursuit of prying Malcolm away from watching the news to feed them their chow. They arrive first for a gentle rub, a few scratches around the ear, a pat on the belly. A sweet, loving reminder to be fed. If they timed it right, it will be a commercial break, a good time to fill their dog bowls. If that doesn’t work, they try nudging Malcolm’s elbow, hoping to displace some prized Coke-a-cola poured over shaved ice onto his pants, forcing him to arise to clean up the spilled sticky mess. Once up, it’s usually a given they’ll be served dinner…. As last resort, and Malcolm still needs prompting, Amore does her race through the house routine, landing on all fours, she slides on the hall rug, getting a free ride into the living room. Weeeeee, look at meeeee! Crash! She resembles a surfer dude riding a big wave. Dolce has now entered into the melee, barking at Amore, she scares Gordita, our fat cat, into using Malcolm’s leg as a spring-board, claws digging into his thigh to gain purchase as she continues to leap over his shoulder towards a safe haven. Yep, this will get them their kibbles…. Malcolm has 5 minutes to hide the destruction before I arrive home from work. Dinner just might be late…. Try this sauce with beef tenderloin as well! Heat oil in a large skillet. Add pork, browning on all sides. Transfer pork to a covered roasting pan. Deglaze skillet with port and reduce by half. Add chicken stock and bring to a boil. Pour over pork and bake at 450 degrees until done, approximately 15 minutes. Remove pork and keep warm. Reduce liquid by half and slowly stir in cream. Cook over medium heat until sauce thickens. Add Stilton cheese and stir until blended. Spoon sauce over sliced tenderloin. The last few days have been bitterly cold. The car thermometer showed single digits on the drive into work, add some wind into the mix and the temp with the wind chill factor is in the negatives. I feel like Ralphie in the Christmas Story when we bundle up to take the girls for their walk – can’t move! My arms stick out and I have to turn my whole body to see to my left or right. But the girls looove the cold and the snow, so we persevere and brave the cold, we pile on layers and layers of thick socks, silky thermals, woolen scarves and gloves, ear muffs and heavy snow boots to tread through the snow. We hike through drifts, slip and slide across icy patches, and break new trails trying to find some virgin snow for the girls to play in. Dolce loves to make snow angels, Amore just loves the cold. Our reward at the end of the trail? If we finish our trek before 5:00 p.m. – we whip up some hot chocolate with some added peppermint liquors . After 5:00 p.m. and we go for the stronger warming up beverage – Santa Fe Sluggers. Heat milk and salt for the hot chocolate in a saucepan over medium heat and steam is starting to rise. Add the remaining ingredients and whisk until smooth. Continue to heat until just before the mixture comes to a boil. Ladle into mugs and top with frozen whip cream (see below). Beat cream, pulverized peppermints and sugar for the whipped cream to stiff peaks. Pipe or spoon onto a baking sheet lined with parchment. Sprinkle with crushed peppermints and place in freezer until firm. About 20 minutes. Heat coffee, bourbon, Kahlua, chocolate and 2 tbsp. cream in a 1 1/2 quart saucepan over low heat, stirring constantly, until chocolate has melted. DO NOT ALLOW to BOIL!Beat remaining 1/4 cup cream with sugar to stiff peaks. Pour coffee mixture into two large mugs and top with the whipped cream. Snow. The girls loooovvve the snow! AND, everything that goes with snow! Dolce especially. Her eyes light up with excitement, her tail wags with anticipation, her body quivering with eagerness at the mere mention, the slightest hint of snow. The little pup in her rises to the occasion – she is ready for play! Her eyes dart from snow patch to snow patch frantically searching for the best knoll, one with the steepest incline and the most snow covering it’s side. She plows through the powder to the summit, does her flop and drop and slides down the hill. Belly up or belly down – either way, the avalanche has started! For those at the end of her slide, beware – she has no brakes, no intention of stopping, no pause in her play. 100 pounds of uncontrollable dog is about to plow into you. Back up the hill she runs for a replay of the first slide, belly plop and down she goes, legs askew, stomach on skids. Her favorite is creating and designing snow angels. She’ll drop down in the snow and roll back and forth, over and over and over, biting at the frozen crystals as she stretches and rolls. Gets up, shakes off the ice and flurries and begins another quest for an angel. The joy in her eyes as she frolics is worth our cold noses and numb fingers. A tired dog at the end of the day makes for a happy owner. Friday. 5:00 p.m. Time to close up shop. Time to shut down the computer, turn off the copier and printer. Time to head home to the hubby and dogs and start the weekend. A half-hour later I walked in the house. I was tired, hungry and grouchy and there was my sweet, wonderful husband, waiting for me at the door, a blended margarita with salt in his hand, the dogs eagerly awaiting to be allowed to hug me in their welcome home attack, a platter of appetizers (okay, cheese and salami with salsa) sitting on the kitchen counter. Malcolm grabbed my purse and handed me my drink with orders to go outside and sit on the lounger on the portal. The girls followed me outside and waited for me to get comfortable. Once settled, Dolce immediately crawled up on the long wicker lounge, curled up between my legs and put her head on my lap. Tiamo sat by my side, getting her ears gently rubbed as Malcolm and I caught up on the week’s happenings. One margarita led to two, cheese and salami ended up being dinner, we watched the sun set over the Sandia’s while the tension eased and I was able to relax. Dolce never lifted her head from my lap, Tiamo never left my side. Amore would amble over every so often throughout the night ensuring all was well. Malcolm and I talked until well after all the stars were lit and sparkling. It was one of the best nights ever and the start of our “wine nights”. The following Friday, I was able to head out for the weekend without any phone calls or delays. On my drive home from work, I called Malcolm and asked that he uncork a bottle of red wine and pour two glasses, I’d be home soon. Summers in Santa Fe are gorgeous – it’s our monsoon season, afternoon showers help cool down the day’s heat and create some spectacular sunsets, showing off the colors of the sky as it opens the door to the night. Malcolm had put together another tray of hor de oeuvres which we nibbled on throughout the night. We sat outside on the portal, the dogs at our feet, content in hearing our voices as we conversed, sipping on our wine. We have continued our Friday night wine nights ever since. On occasion we invite friends and neighbors over to join us, but mostly it the two us and the girls. On cold winter nights we will light a fire while we enjoy a warm toddy, Dolce always by my side. Since Tiamo’s passing, Amore has taken to laying down at my feet, keeping them warm, letting me know she is right there. She’ll lift her head when she hears a car drive by, check out what’s happening when Malcolm gets up to add another log on the fire and come right back to me, leaning up against my feet. Eventually, she’ll roll over and start to snore, relaxed and at ease. I believe the girls enjoy the evenings as much as we do. I believe they hear the cadence of our voices, the low tones of our words and know their family is all right. All’s well. Start your own Friday night tradition with these Blackberry – Poblano Margaritas. The deep purple color is a stunner! Muddle the blackberries and poblano peppers in a cocktail shaker. Add a tablespoon of superfine sugar if the berries need a little sweetening, at this point. Add the tequila, Cointreau and ice and shake. Strain into two margarita glasses filled with ice. May substitute with raspberries, blueberries or a combination of berries. To avoid pulp or seeds in your glass, strain before serving. Left-overs. We all look forward to the day after Thanksgiving – the day that produces the motherload of all left-overs! Turkey sandwiches, turkey enchiladas, turkey soup. And then there is sweet potato pancakes, potato balls and a lot gravy with a little mashed potatoes. Cold stuffing, Cornbread stuffing, and just being stuffed. Sneaking into the kitchen late at night to nab the last slice of pumpkin pie, hiding the treats and cookies from Malcolm, standing over the kitchen sink feasting on dinner scraps rather than wash another dirty plate. Each year, we swear on our full bellies, that the next year we aren’t going to eat so much or drink too much. Each year, we do anyway. Each year, we swear we are going to cut back on the menu and each year we add another “must-try” recipe that becomes a staple for next Thanksgiving’s table. Each year, we try to give away the left-overs to our friends and guests and each year we end up with even more left-over filled Tupperware freshly burped in the frig. Dolce and Amore love the idea of left-overs. As puppies, Dolce and Amore loved the left-over pumpkin scraped out of the can not used in the pie. Baking day still finds them at the edge of the kitchen hoping for some tasty morsel to land on the floor. They know the rule, it falls on the floor, it’s theirs! (Loaded with fiber, pumpkin is actually good for little puppy stommies and their digestion.) When the chef is in the kitchen prepping for the Thanksgiving dinner, these two pray to the high heavens for dropped cheese crumbs, turkey scraps and potato peels. They wish for an apple slice to fall, carrot chunks to plummet and diced celery to plunge off the chopping block and into their waiting jaws. It is a contest between them which one snatches the left-over treasure first. My favorite left-over is pecan pie. Warm from the oven or cold for breakfast, pecan pie is my preferred holiday left-over dessert. It’s the perfect midnight snack. A little whipped topping, a dab of ice cream (if there is any left) and a sliver of pecan pastry. Yummmm! Here is my “must-try” recipe. Enjoy! WARNING: Hide from husbands and dogs – will disappear off counter! Prepare a deep dish pie pan with cooking spray and set aside. Place the first 3 ingredients in a food processor, and process until finely ground (approx. 30 seconds). Add butter and pulse or until combine. Add 1 tbsp. ice water and pulse again until combines. The mixture will be crumbly. Press oat mixture into the bottom of a 9″ deep dish pie pan and up the sides. Bake for 15 minutes or until lightly browned. Let cool on a wire rack for 10 minutes. Reduce oven temperature to 350 degrees. Combine brown sugar and next 8 ingredients in a medium bowl, stirring well. Stir in pecan halves. Mix. Spoon filling into prepared crust. Bake at 350 degrees for 50 minutes or until center is set. Cool to room temperature on a wire rack. Amore loves to run. She runs just for the hell of it. And, when she knows it walk-time, she is besides herself with excitement. She knows she’ll get to run. Amore knows when we put on our hiking boots, its run time. Amore and Dolce are out the gate and into the car in three seconds flat. They can cut the load-up time in half if the tailgate on the SUV is already down and the truck is backed up to the gate. We like to take the girls out to the Galisteo Basin for their daily walk. 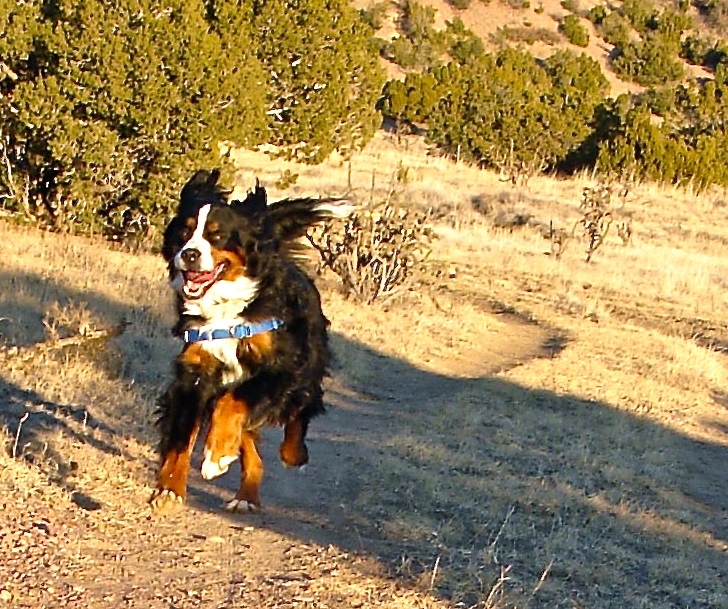 There are some great hiking trails and the two love to chase jackrabbits and cottontails. It’s quiet, not a lot of people know about the preserve and we’re able to let them run off leash without worrying. Of the two, Amore is our scout when on the trail. She’ll run ahead of us, looking for movement of any kind. Birds, lizards, horny-toads, she is off like a shot when her attention is grabbed. She gets about 50 yards ahead, looking back at us to ensure we’re still a comin. A couple years ago, we started training them to return at the call of a whistle. We would reward them with a treat when they hustled back to us, making them sit before they received their prize. Amore picked up on the game quickly – knowing there was a treat to be had, she would run full throttle back (without being called) and sit at our feet waiting for her treat. If we didn’t give her the goods, she would stand in front of us and not let us pass, determined to get her nibble. One time, just as we were starting out on our hike, Amore ran past us up the path. looped around a Pinon tree that was only 10 yards ahead and came back in a hurry. She sat down and gave us that look that said, “see-how-good-I-am-now-give-me-my-treat”! Now Dolce, she is smarter and wiser. She usually trots behind us, letting Amore get a ways up the trail. When we blow the whistle, she is already in place, siting on her haunches, waiting. She has figured out she has a 50/50 chance she just might get an extra bite in before Amore arrives back. And, smart dog that she is, she usually does get that extra treat! Dolce is our sniffer. She likes to lollygag her way through our trek. She’ll stop to smell who’s been by, sniff every low hanging branch and leaf, check out what wildlife has been through and leave her scent on every weed and bush. She is especially crafty when it comes to eating something she’s not suppose to. She’ll hang back just far enough that she’s able to nab a horse apple before you can call her on it. Horse crap on a dog’s breath is NOT pleasant! Malcolm and I pay the price on those weather-ridden days the girls don’t get their walk. Two dogs, full of energy, cooped up in a house is not a good scenario. Shoes go missing, toilet paper gets shredded, rugs are in disarray. Then the sumo wrestling starts – body slamming and tail-chasing is not an indoor sport. Leap frog is the next entertainment and the competition is fierce. Dolce has the lead in jumping. Amore wins hands down on speed. They are two for two for most creative crashes. Like those parents who tote their children to sports practice at 5:00 in the morning, we drive our “kids” to the basin for their walk. In the snow, cold and wind, (I won’t walk in the rain) we bring the girls to their special spot of nature and let’em run and sniff to their heart’s content. The happiness in their eyes is worth it. She claimed it was too hard to eat, too difficult not to slurp, and some of the sauce will always land on your “shelf”. She might as well of sent me to purgatory! Perhaps that’s why my dates were few and far between. I knew I had found my soul mate when Malcolm (my hero!) served me pasta in bed! Pasta and butter and cheese. Pasta and butter and cheese and bacon. Pasta and butter and cheese and bacon and shrimp. Add some garlic, a splash of olive oil, a little white wine, throw in some fresh sourdough bread and I am in heaven. I don’t even need a plate, I will enjoy my meal straight from the pasta pot. It’s best when I don’t have to share it with Malcolm. Forget the soup when I’m sick, I’d rather slurp noodles. Rain or shine, hot or cold, pasta is my nirvana. I will say, as I’ve matured, so has my pasta pickiness. I don’t eat just any pasta. Nor, do I eat at just any Italian restaurant. I do have some standards when it comes to pasta. The noodles need to be cooked just right, the sauce needs to light and teaming with flavor. The restaurant can’t be a chain, franchise or serve processed pre-packaged portions. When cooking pasta, proper attention to your pasta pot needs to be given – a built-in strainer is convenient. Correct utensils are needed. Pasta bowls should be purchased, along with over sized spoons. Timing is everything. Under done noodles or overcooked pasta doesn’t cut it. Invest in a pasta timer! An apron is appropriate attire when standing over the watched pot. Pavarotti should be softly playing on Pandora in the background. And most important, ALL DOGS SHOULD BE BANNED FROM THE KITCHEN. DOG HAIR IS NOT ALLOWED OR TOLERATED ANYWHERE NEAR THE PASTA POT! Cook the macaroni according to the directions on the package. Drain off the water and put noodles back in the pot, set aside. Melt butter in a medium saucepan, add jalapeno peppers and saute for 1 to 2 minutes. Add flour and cook for another 3 minutes, stirring continuously. Whisk in the milk and continue stirring until the mixture starts to boil. Add the Cheddar Cheese, Parmesan Cheese and mustard. Stir until smooth. Pour cheese sauce over the macaroni, add bacon crumbles and toss. Place in a casserole dish and garnish with the bread crumbs. Heat in the oven until hot in the center and bread crumbs are toasted, about 15-20 minutes. I’ve decided the girls will eat anything – even tomatoes! We had been given some home-grown tomatoes while visiting at a friend’s house. On the way home, I stopped the car at the top of our driveway to get the mail, leaving Dolce and Amore in the car. As our mailbox is directly across the dirt road from our driveway, I put the car in park, set the brake and hopped out to quickly to retrieve our mail. We do this all the time. It only takes a few seconds. But a few seconds is all the girls needed to chow down on 4 of the 5 just picked off the vine, tomatoes. Leaving us one precious juicy red tomato. It was obviously Malcolm and I were going to have to share. Not a good scenario when both of us are the youngest of many siblings. Coming from a household that used the adage, “You cut, I pick” to stop fights over who got the biggest piece of pie, I knew this wasn’t good. Malcolm is from the south and home-grown tomatoes are as sacred as Sunday after Church fried chicken. As I prepared dinner, I looked at the surviving tomato, checking out the misshapen size with the deep valleys and divots. I realized I would be able to fool Malcolm into picking the “short-end of the stick” half of the tomato. Score: Megan 1 – Malcolm 0 And, no, I probably won’t be going to heaven! This grilled vegetable goes great with bbq steak! Blend the first seven ingredients together in a bowl. Snip the chives with a scissor (or cut with a knife) over a cutting board. Add the tarragon and parsley with the chives and finely chop. Stir into the sour cream mixture and let stand at room temperature for 15 – 20 minutes. Cut tomatoes in half and drizzle open sides with the olive oil, season with salt and pepper. Place tomatoes on the hot grill, cut side down, until softened and slightly charred, 8-9 minutes. Carefully remove from the grill and serve warm, topped with a tablespoon of the sour cream mixture.